World renowned plastic repair guru reveals the tactics that he uses to identify and repair plastic bodywork. These tactics are SO powerful that OEM part manufacturers are trying to keep them under wraps. Now YOU can join the INNER SANCTUM of people privy to these closely guarded secrets. Now you can kiss your plastic repair problems good-bye forever and you can start doing the kind of repairs the so-called experts said were impossible. 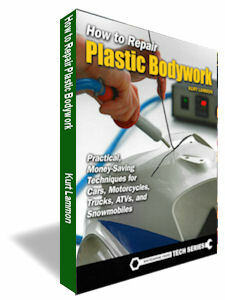 Here's why...Kurt Lammon has finally put into print all the secrets of plastic repair into an easy-to-read book. These are the same techniques used by thousands of body shops and bumper recyclers from around the world. This intense, no-holds-barred, plastic repair "bible" should be required reading for every autobody repair man. This book is jam packed with time-saving and cost-cutting methods to repairing plastic. From this book, you will discover countless new ideas and facts which tell you the "how's", the "what's" and the "why's". These are techniques that you can start using immediately to save a fortune over buying new parts. In addition to learning how to repair plastics, you also learn why the parts were made of plastic to start out with! Not only that, but you will learn how the parts were made. This insightful knowledge will give you a better understanding of why a certain repair method is best for a particular type of plastic. In only 144 pages, Kurt's secrets will be yours. You'll hear it straight from the horses mouth as Kurt tells you the exact steps needed to model his success by applying his formula to you own business. Your detailed, probing questions are answered with simple, step-by-step coverage of exactly how to do repairs right the first time and every time. And let me tell you, Kurt really spills his guts in this book. He held nothing back. He covers all the details without confusing the reader and, without intimidating the reader with a bunch of gobbledygook and "tech speak." · EXPOSED: Plastic repair myths that have plagued the autobody repair industry for years. They tell you that you can't fix plastic. Nothing could be further from the truth. Kurt lays it all out for you. · Plus much, much more! As you can see, Kurt really delivers on his promise to reveal all. How unique, innovative, and valuable is all this cutting edge information to you and your business? Obviously, what you've seen so far is pretty impressive on its own. But there is even more to this book than you may realize. This is NOT a lame "e-book" that you have to download and try to read on the computer screen. Those so-called "e-books" end up costing you more than the real book when you add up the price of the paper and toner you would waste printing them. This is a real, hold-it-in-your-hands, take-it-to-the-shop book that you can sit down and read. Need it quick? Get overnight delivery! Kurt was asked how much he would charge customers for a personal consultation. He responded that he doesn't consult, but if he did, he would charge a minimum of $100 per hour. Given airfare, hotel and car rental expenses (another $1,000 easily)... and given that it would be very difficult without some previous knowlege of plastic repair to ask just the right probing questions that Kurt has been asked by others over the years, you can imagine how much it would cost. Sure, you might ask many of the questions that Kurt has been asked over the years but, I highly doubt that even for $10,000, you'd still get the exact information that is revealed in this book. Given that it would cost you a fortune to get all this information on your own, what would you expect to pay for information so valuable? At $495 it would still be a bargain considering the alternative ways to get this information. This book costs 1/500th of the minimum cost it would take for Kurt to reveal this information to you in person if he was willing to do it. I can't put an exact dollar figure on what this book is worth to you - only you can do that. But I can tell you this: at the low price of this book could very possibly be the best bargain and best investment you'll ever make in your entire life! It's worth repeating, this could be the best bargain and best investment you'll ever make in your entire life! I'm not kidding when I tell you that this book has WAY MORE value than the ridiculously low price for this book. Surely, you see the value of this amazing book. A year from now you could still be struggling to identify and repair plastic... or, you could be making money doing plastic repair the right way and doing it quickly. It's a pretty fantastic deal when you consider how much this one book can catapult your business and your sales.